If you remember a wedding card post I did back in August you may remember that I mentioned I had created two cards, one for the bride and groom and one for the parents of the groom. Well here I am several weeks later finally posting the card for the grooms parents. The card base is 5" x 7" made from Baja Breeze textured cardstock. I added a layer of Crumb Cake and another layer of Baja Breeze textured, both with torn edges. On the top Baja Breeze layer I stamped the large flower from the two step Level 2 hostess set Fast & Fabulous. Both steps were stamped using the Baja Breeze ink. I also stamped my sentiment Congratulations from the SAB set Well Scripted in Baja Breeze ink. 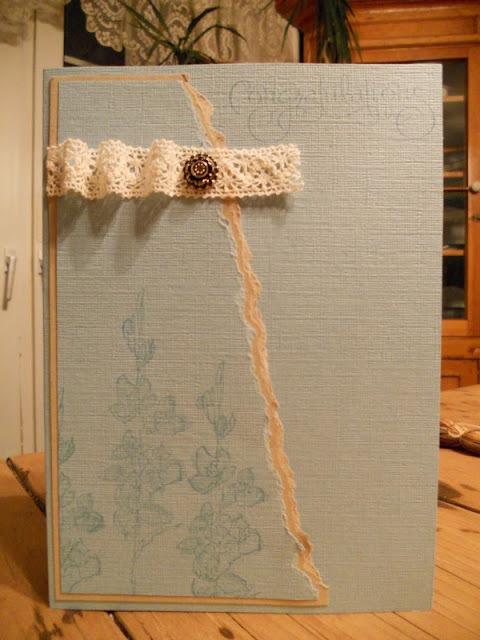 I wanted a little Victorian flair, so I added some Victoria Crochet Trim to my card front but rather than laying it flat I created some 'waves' in the trim. Also to enhance the trim I added an Antique Brad. I put this through my top layers of cardstock before adhering these layers to my card front. This card took me forever to make for some reason. I just wanted it to be perfect but not overdone. I am very happy with the results. This is great. Have you ever used lace on a card before? I love the 'wave' you gave to it. Good job. You should be happy with the results - it's beautiful!! Such a simple elegance. You hit the nail right on the head, it's gorgeous but not at all overdone. The wavy bit of lace at the top was the PERFECT embellishment. I'm sure the groom's parents were very touched - what a stunning, thoughtful card. This is so elegant and beautiful! Love the lace!